We’re for new housing as adopted in SODC’s approved 2012 Core Strategy. We’re for the preservation of sites providing an historic, established and valued amenity to all residents. We’re against development without pre-existing infrastructure. Campaign supporters meet with Ed Vaizey on the Green Gap. August 2015. We believe the villages around Didcot should not become suburbs and that if this plan succeeds more will follow. We are worried about road safety, school capacity, and the loss of grade one arable land that is a rural and visual amenity. We are concerned that the plan will disadvantage those in the Fleet Meadow area, and will adversely affect East Hagbourne’s significant conservation area. We support the need for more housing but think this development is not consistent with the South Oxfordshire District Council’s published planning strategy, nor consultation results, and should be stopped. The campaign was started after an open meeting on 23rd July 2015 attended by 148 residents of East Hagbourne and Didcot. The overwhelming majority at this meeting, and many others too, feel strongly that this development is the wrong scale in the wrong place. 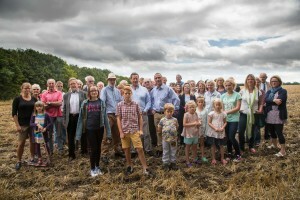 The campaign is supported by Ed Vaizey MP, The Campaign for Rural England, Didcot Town Council, and East Hagbourne Parish Council. 1) The Gap – Why does it Matter? If this site is developed as proposed by Grainger the last meaningful green gap which both defines the South-Eastern extent of Didcot and the Northern boundary to the Village will be lost permanently. When Fleet Meadow/Millbrook was recently re-designated as part of Didcot it was explicitly stated that the gap with East Hagbourne would be protected and respected. This will clearly not be the case if any development is sanctioned here. The very existence of East Hagbourne as an independent village, as opposed to an additional suburb of Didcot, would be threatened by continuous development on both sides of New Road. Preserving this green gap is recognised as important in SODC’s 2012 core strategy. Giving planning permission may set a dangerous precedent for further even larger developments on both sides of New Road. This is not scaremongering. The larger section of the field to the south of the Grainger land is in the ownership/control of Nurton Developments (see map) and they have formally applied to have this site included in the new 2031 Local Plan. Their submission clearly states the intention to develop the site for up to 350 additional houses, subject to planning. Their site registration states access is “achievable with collaboration with owner/ developer of land to the north” – ie the Grainger site. In addition, it is understood that home owners on the Eastern side of New Road have been approached by agents for the developer seeking to purchase their homes to create alternative access directly from New Road. When development on this scale is proposed it will inevitably produce very significant increases in traffic flows on New Road, on Jubilee Way and Main Road to the detriment of the amenity of the many homes fronting onto these roads. In addition many school children attending Hagbourne and other local schools need to cross these roads and their safety may be compromised. We are not opposed to the slow organic growth of the village that has occurred over recent decades. The village of East Hagbourne comprises approximately 600 homes. The Grainger development at 175 units would represent an increase of around 30% at one go. Should the Nurton Developments Site to the South also be permitted then the combined 525 units would represent an 85%-90% increase in home/people numbers, and in a very short space of time. The people of Didcot and surrounding areas were extensively consulted by SODC as to where they felt the most appropriate locations were for the future expansion of Didcot. A very clear majority backed development to the West and North of Didcot and this is now adopted policy in the 2012 Core Strategy. The Grainger site forms a part of option site D which was the least popular first choice with less than 2% of respondents selecting it as their first choice. Grainger’s development on its own will have a very major impact on the demand for school places in our already popular local schools and will have impact on local healthcare and other services which are already under strain. The green gap provides an important rural amenity not just to those living in Fleet Meadow/Millbrook and opposite on New Road whose homes overlook it, but to all those who use New Road. Not least it provides our only view through to the Area of Outstanding Natural Beauty (ANOB) just to the East of the village. In recent years homes on Fleet Meadow/Millbrook have suffered flash flooding to garages and to external areas exacerbated by a very high local water table. Test trial pits/boreholes recently made on the subject rapidly filled with water. The Grainger development will inevitably increase the amount of paved and other hard surfaces which may increase the rate of surface water run-off. East Hagbourne has a major Conservation area covering the majority of the centre of the Village that is important in a District wide context and contains 47 Listed Buildings. Whilst the proposed development does not immediately adjoin the Conservation Area its impact will be felt in the wider setting and in a significant traffic increase on Main Road. Not only is this site not “Brown Field “(previously developed land) but virgin “green field land” that is specifically noted in previous development applications for the same site as being a mix of grade 1/2 agricultural land that is regarded as particularly suitable for high quality/yield food production vital for our growing population.